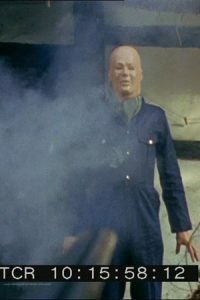 Here’s me as the Auton searching for the Nestene ‘swarm leader’ meteorite at the farmhouse. I’m confronted by a terrified Meg Seeley (Betty Bowden), who threatens to blow a hole in me. Meg fires, and my tunic erupts with explosions as the cartridges hit. This was achieved by SFX man John Horton placing small explosives inside my tunic, which were detonated remotely (via trailing wires the camera doesn’t see) when Meg fires. Although of course the Auton has no expression, in this scene I always feel it has an almost hurt look as if to say “No need to take that attitude, I’m only a poor Auton doing its best to obey instructions.” Then they all had a tea break and I had to stand watching them because, as mentioned before, the Auton mask had no working mouth!